You have an abundance of expensive electronics in your home. Phone. TV. Stereo. Computer. Laptop. Microwaves. Dishwashers. And many more. When plugged in to the mains these electronics work off the safe and standard 120 volts of electrical flow originating from the power station. But a power surge – a sharp increase in that voltage – can affect the intricate and delicate circuitry in these electronics, rendering them damaged or even destroyed. That is why you have surge protectors whose job it is to protect your electronics from unforeseen and unwarranted voltage fluctuations. When we define a power surge we are referring to an increase in the voltage flowing into your home’s electrical system that substantially exceeds the standard 120 volts of electrical flow. Electricity is like water, moving from one end of the wire to another, from the wire in your home all the way to the electrical grid responsible for generating electricity. A spike is a short increase in voltage, while a surge is one that last 3 seconds or more. The causes of a surge are lightning strikes, power outages, tripped breakers, overloaded sockets, or problems with the electrical grid. The job of a surge protector is to detect the excess voltage caused by a surge and divert the extra electricity into the grounding wire, which is a protective component in the surge protector itself. This neutralises the excess power and ensures that only the normal, safe amount of electricity passes through to your devices. 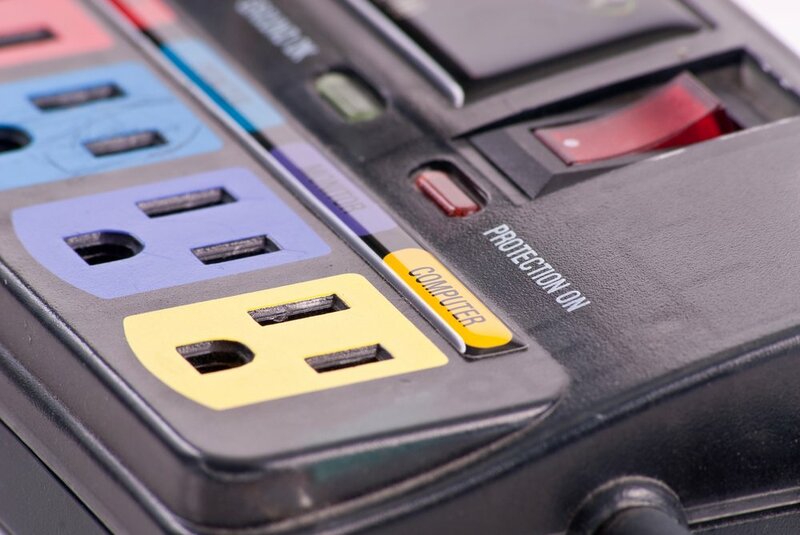 Surge protectors usually come in the form of strips for multiple device outlets (don’t mistake them for a common power strip; these have no surge protection). You can also pick up travel surge protectors, which offer fewer outlets but will fit into a travel or laptop bag. Yes, you really do. Especially for older components whose likelihood of failure increases with each passing year. You don’t need a surge protector for your fan or table lamp; but in an area with multiple plugs from multiple devices linking into one mains socket – think the computer terminal or TV area (always a jungle of entwined cables) – a surge protector is a must. Don’t overload sockets, and don’t have multiple appliances running at once. This has the potential to overload your home’s electrical system and risk an electrical fire. HOW MUCH DOES A SURGE PROTECTOR COST? You don’t have to go overboard on cost when buying a surge protector. A basic surge protector is fine for a standard electrical outlet and can cost as little as $6. A proper surge protector needs to be equipped with a breaker to trip the device and have an indicator light to let you know it’s working properly. If you want additional protection you can purchase more advanced surge protectors that have additional fail safe mechanisms or that work with other types of connections, such as a USB or a barrel connection for cable TV or phones. Here is a link to some recommended surge protectors, ranging in price. Surge protectors don’t last forever; they need replacing every few years. Harnessing electricity is a marvel of human ingenuity, but it can quickly become a bane – and a danger – if used incorrectly or inappropriately. Practice safe electrical use and teach your kids about electrical safety. When in doubt or danger, or if it’s time for that all-important-should-not-be-skipped regular maintenance check, call a professional Kelowna electrician at Epic Electric. We’re open around the clock, 24 hours a day 7 days a week.